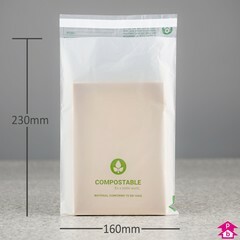 These milky-white, semi-transparent compostable mailing bags are made from natural potato-starch and other biologically sourced polymers. 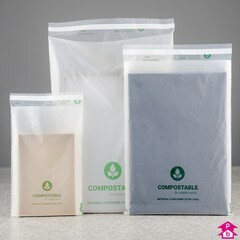 The compostable material (which is thermoplastic and plasticiser-free) is certified "OK Compost HOME" by the certification authority Vincotte. 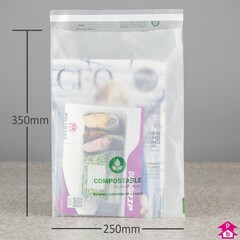 The back of the mailing bags are printed with a green compostable leaf logo and the words 'COMPOSTABLE for a better world', with 'MATERIAL CONFORMS TO EN 13432' underneath. 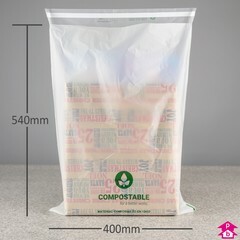 The bag has a self-adhering *peel 'n seal strip (please see below). 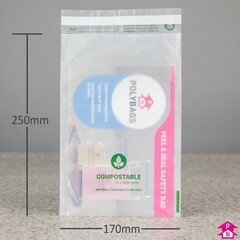 100% biodegradable and compostable in accordance with EU directive EN-13432. 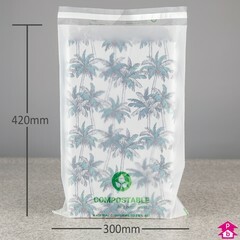 Store bags away from direct sunlight, humidity and other heat sources - use within six months of delivery. Due to the nature of the material the peel 'n seal strip is only semi-permanent on initial contact sealing. 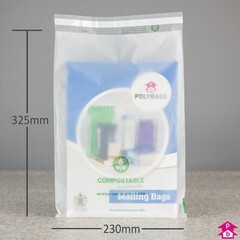 A more permanent seal may require the mailer to be left at room temperature for several hours once sealed.